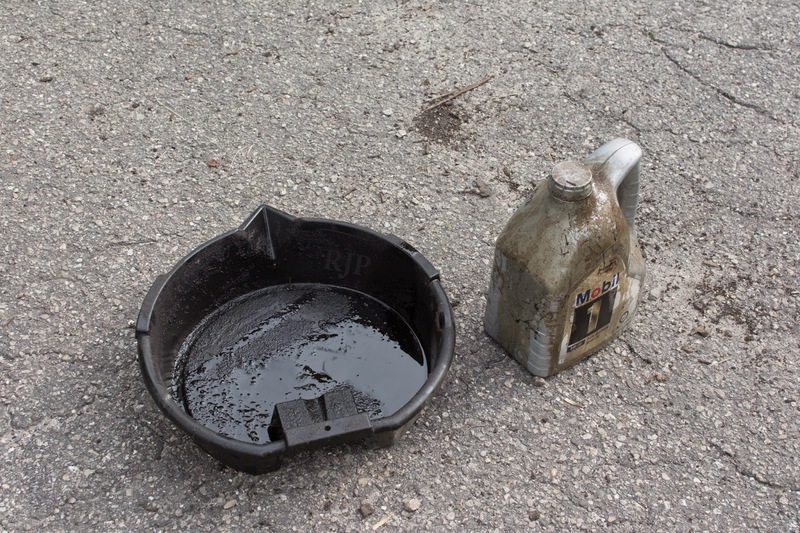 For you guys out there (and maybe a few of the ladies) do you remember when you changed oil with your dad for the first time? Well as a society we hardly do that for ourselves anymore. I like to do hands on projects and know how to fix stuff and it has been years since I have done an oil change. Well the farm truck needed an oil change and so I decided I would show Reed how to do it. First I had to plan ahead and get oil and filter. We always have oil around, but filters, not so much. So off to Fleet Farm. Next we had to find a time when father and son could do it. Sunday evening seemed to fit the bill. We get the oil draining and then Reed has to decide how to get the oil filter off the engine. He finally decides the right angle of attack is to do it from below. Like every strong young man he puts a nice crease in the side of the filter, I used to do that too, so that is a normal Petersen result. Now to put the new filter on from the top this time, we oiled the gasket and then finally get the right angle then spin that baby right on down to the gasket seat and a good 1/4 turn to tighten. Oil plug back in and add 6 quarts of oil and start it up to fill the filter before checking the level. Mission accomplished. Execution time 1 hour. It took 1/2 hour to find the tools and 1/2 hour to do the work! Reed observed that it would be cheaper and quicker to have the oil changed at the garage. Yep, it sure would, but then I wouldn't have a chance to pass down the legacy of the "lost art" of the oil change to my son and he wouldn't have this priceless education. I always figured changing oil was a rite of passage that every young man should endure. I had a friend who's son got a car recently and he told me that he did his first oil change. I was thinking of all the rigmarole Reed and I went through. Nope, his son took it to the garage and watched someone else change the oil. Well I guess that is a rite of passage too. Just the same, only different.